Dah banyak hari kita beraya, but today I would like to share my bad experience with inconsiderate people during Ramadhan this year. These people were so inconsiderate sampai rasa nak pergi tepuk kepala sorang-sorang to knock some sense into them. It happened in MidV@lley during one of the weekends of Ramadhan. We had just finished some last minute shopping for Daniel @ J*sco T@m@n M@luri and were heading home for iftar. Since we were cought up in a bad traffic on the Fed Highway, Hubby decided to buka puasa @ MidV@lley. And since it was a bit late already, we were rushing to the surau for Asar (gajah) prayer. Hubby asked me to go first while he took care of Daniel. And boy! It was a tremendous feat to get into the surau! It was SO DAMN packed with people! Getting inside the surau was one thing. Trying to get into the ablution area for wudhu' was another tough task! Imagine queuing for more than 20 minutes just to wudhu? And at that time, I hadn't realize it yet. While looking around, scouting for a waqaf telekung because I forgot to bring my telekung bag from inside the car, only did I realize that those people whom filled the surau were not actually praying! These groups of youngsters were having enjoyable conversations in waqaf telekungs with food and drinks on stand-by while they wait for the iftar time! They filled the surau to the brim, until people who were REALLY praying had tu hunch and menyelit where possible to pray! I understood that they want to be done with their solat Maghrib first before they enjoy the iftar feast outside, but please! Couldn't you be more considerate? And did you think that you obtained extra pahala by solat Maghrib di awal waktu while depriving other people who tried to solat Asar but couldn't because of you? I admit that I was late but it wasn't done on purpose. Otak letak kat lutut ke??? I was so mad at that time and am still mad now when I reminisce the incident. 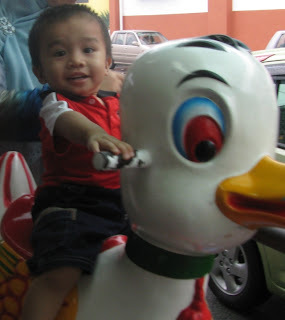 Eii geram sungguh!!!! 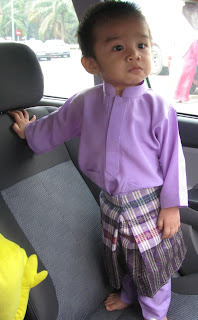 We went back to Jasin for the part 2 of our Raya last weekend. Sempatlah beraya ke rumah Hubby's relatives yang tak sempat kami visit masa raya part 1 hari tu. And we got the chance to meet M@n Tiger yang dah bertahun tak jumpa. Last jumpa masa sebelum grad uni tahun 2000 rasanya. He's happily married with 3 children now. And married to someone I recognize back from Uni days! She used to hang out with my housemate, that's why she looked so familiar. Tak sangka ko M@n Tiger..Senyap-senyap je ye! Anyway, we (Hubby & I) are still clueless on why people call him M@n Tiger.. Nak kata rupa tiger takde. Nak kata garang macam tiger pun tak tau la pulak...hehe.. Anyway, Daniel clicked instantly with their children. Something that was so unusual for our shy baby. We were amazed a.k.a hairan to bits! Siap masuk bilik, pergi dapur lagi. Tau-tau dah lepak kat atas sofa depan TV..hihi...We had a great time catching up and promised to meet again next time we go back to Jasin, InsyaAllah. On Sunday, we stopped by Hubby's Grandma's house before heading to the hospital to visit his cousin who was under intensive care unit for viral infections to the brain. I didn't go to the unit because Daniel was not allowed to go there, but according to Hubby and his relatives, the condition was quite severe and he needed help to breathe. Pray that he gets better soon although I don't really know him. On the way back, we stopped by Kot@ Damans@ra to attend Imtiyaz's 2nd birthday bash. Sorry we were late Nins, but the food was excellent and thanks a lot for the gift. Met with the other hot gucci mommas with their babies (and hot gucci Kak Wegra also..hehe..)and it was fun! Happy birthday Imtiyaz! May you have many, many more years of health and happiness with the TLC from your Mama and Babah! Kejap je Private Practice and Grey's Anatomy dah 6 episodes. Memang best layan dua-dua series ni. The first 2 episodes of PP were a tear-jerker. Sadis sangat! The interns in GA pulak dah became 1st year residents except for O'Malley. They have new interns pulak. First few episodes tu macam boring sikit sebab feeling dah lain. As residents, diorang dah kerek sikit compared to the times they were interns yang selalu kena buli. Tapi episodes yang seterusnya dah start interesting balik and I tak sabar-sabar nak tunggu Saturdays each week because that would usually be the day that my downloads of the 2 series would be completed. Lepas tu, layan la.. Best!! 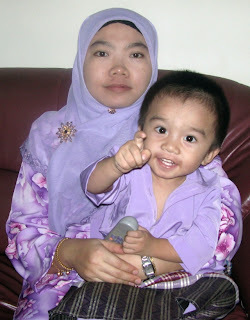 Pagi raya @ Punc@k Al@m...Lamanya dah tak balik sini..
Mummy forcing Daniel to wear the kopiah that Nenek knitted for him. It's a smaller version of his Ayah's kopiah that Mummy knitted. Tapi Daniel memang tak suka anything be put on his head sejak dulu lagi. Tak tau kenapa.. I am safely back at home now after 4 days of vigorous travelling, alhamdulillah. Had to cut short the holiday because Hubby got an internal exam today at his office. I didn't get a chance to eat any lemang this year. Ketupat, nasi himpit, berasak semua dapat rasa. Had been stuffing my face with food all these 4,5 days. Anyway, I had a bad tummy ache on the first day of Syawal. Maybe perut terkejut sebab tiba-tiba kena proses banyak makanan..hehe..Had bouts of diarrhea all day long..Dah la one time tu I really had to go but we were stuck in the traffic on the highway. Nasib baik dapat bertahan..hehe.. 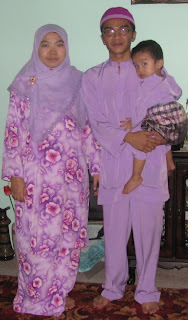 Anyway, my sister celebrated her birthday on the first day of Syawal this year. I baked her a cake (well two cakes actually sebab the first one tak jadi..hehe..) and put some cream and deco on top of it..I was so proud of myself.. Didn't get a chance to taste it but it looked pretty enough for a first timer.. Well, I baked cakes before but this was the first time I used cream to decorate. Was satisfied with the result and I resolve to bake more cakes and cookies after this..muehehehehe...Well, at least that will be my plan IF I am going to follow Hubby to his work location later. We travelled back to Abah's hometown in Kulai, Johor on the noon of Raya. Myself, Hubby and Daniel travelled separately from the rest of the clan because we had to make a pit stop at Hubby's hometown, Jasin first. 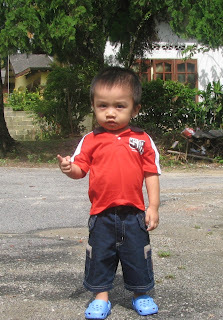 The next day, we went to visit relatives all over JB and we returned to Jasin on the third day of Raya. Spent the night there and came back home the next day (yesterday). 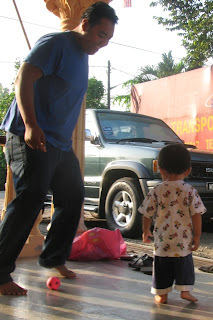 We dropped by Mak's hometown in Alor Gajah on the way back to meet Nenek and my aunty's family. Sempat jugak pergi shopping while we were in Malacca and got myself a new handbag from Hubby..heheh! All in all, a tiring journey but we had fun catching up with the relatives and enjoying the good food. 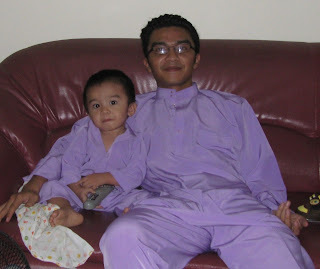 Oh ya..Terlupa pulak..I sempat tempah another pair of baju kurung with my cousin on the third day of Raya..hehe.. I have it with me now tapi belum sempat guna lagi sebab belum beraya to friends' houses here pulak..keke..Tapi this year we didn't get to visit many, many relatives and friends because of the cut short holidays. 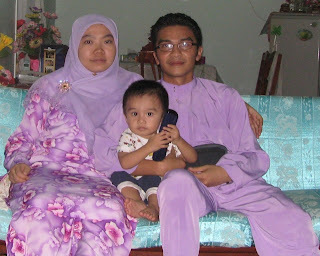 Hopefully the Raya mood will come soon so we will have the Raya blast soon! Without even realizing it, Ramadhan flew past us and it's time for Syawal again. Tak rasa langsung! Seriously! Hehe.. This year I didn't feel as excited as before about celebrating Syawal. Shopping baju raya for baby Daniel pun last minute. Baju raya I and Hubby pun ala kadar je. Mungkin sebab our financial has been affected sebab clients tak bayar lagi debts. So takdela rasa beria-ia sangat nak celebrate. Hmmm..
Salam Aidilfitri to those reading this humble blog. Maaf Zahir Batin for all that I may have done wrong to any of you. Halalkan semuanya ya? Have a safe journey to wherever you are going and have a wonderful celebration! I was supposed to have a Buka Puasa meet with old uni friends today, but Mak called in the morning to say that we have a family Buka Puasa Invitation from her acquaintance tonight also. Aiseh.. We had been planning the old friends' meet since last week but due to many were not able to make it last week, we had to postpone it to today. And now, I had a choice to make..Adus pening! Anyway, told *ty that I will be joining Mak's invitation at Sher*ton Subang first, and later will join them at the restaurant in Shah Alam. That should solve the issue, and everybody would be satisfied. But, not before I got my emotions all worked out because of these comflicting meets. Was moody all day long. We (Hubby, Daniel and I) arrived in Subang at about 6pm after collecting something from the office. We stopped by Carr*four to kill the time, and at about 7pm, we were ready to go. Called Abah, and he said they were just about to leave the house. WHAT? Anyway, the 3 of us went to Sher*ton first to wait for the rest of the family to arrive. When we stepped into the ballroom where everyone had started breaking fast, we couldn't find the host nor the allocated table. I suspected that we were in the wrong room, so Hubby proceeded to ask one of the kitchen staffs. Didn't know whether he was the chef or what but he did wear this tall hat most chefs wear. Turned out that we were indeed in the wrong place. The guy was kind enough to guide us to the designated coffee house, but not before offering us two glasses of drinks for us to break fast and waited for us to finish our drinks before showing us the way. Such a kind soul! Great food to feast on, but at about 8.15pm, we excused ourselves to attend the other do. Saw that *ty called me 2 times but I didn't hear them, so I returned her call but to no avail. Called the other girls at the do, but no one picked up their d*mned phones. Called them so many times! Rasa macam call to TV or radio station to enter some contests pulak. I worked up my emotions again, and since I didn't know the exact location of the restaurant of the meet, and after having a few rounds in Shah Alam city centre and failed to find the place, I called it quit. Reached home, feeling lethargic and upset, I slept immediately as my head touched the pillow. And after about an hour, *rt called and said that they have just finished the meeting and apologize for not picking up my calls because she didn't hear them. Fine... I tried to make everybody happy but I failed due to the circustances..So it was out of my control and I couldn't do nothing about it. Well, there will be other meets, InsyaAllah kalau umur panjang, kan? 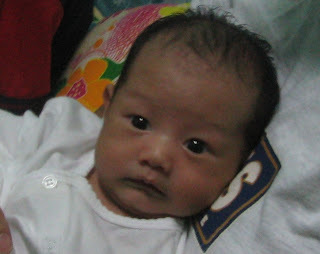 How time flies..And how small has he become..I seriously think he is underweight compared to the size and weight that he was born in..He simply refuses to eat despite being very active and always sleeping late at night. I am quite concerned about this..Must consult his paed immediately. Anyway, today I attempted to bake Hari Raya cookies using the microwave oven for the first time. Had to use the microwave oven since we do not have the conventional one here in the temporary place that we are staying in now. Had to surf through the net to ind the time and temperature conversion from the conventional oven recipe to suit microwave cookies baking. Terpaksa try and error @ belasah je lah. Of course Mum helped me a lot with the preparation since she is on leave today. It turned out quite good (and tasty, too) hehe...So, siapa nak rasa, marilah datang rumah Raya nanti ok? And we have decided that we are not going to send baby to the babysitter's house anymore. Well, hopefully I can manage him while doing the business lah. Since I am home most of the time, and just go out when the needs arise, it is just not worth it to send him to the babysitter's house. Eversince I stopped working, we have never sent him for a complete one month cycle, but we still paid the fees in full. Furthermore, I am still unsure whether I will still be here by the middle of the month. Might be following Hubby to his new location immediately after Hari Raya or a bit later. I don't know. Still undecided and since we don't know the condition of the new place yet, we still cannot plan properly. Anyhow, hoping for the best. On the business front, things are looking good and enquiries kept pouring in, resulting in me finding it a bit hard to handle everything. Takpelah, bersusah-susah dahulu, bersenang-senang kemudian, kan? I'm just hoping that the money will come in soon!